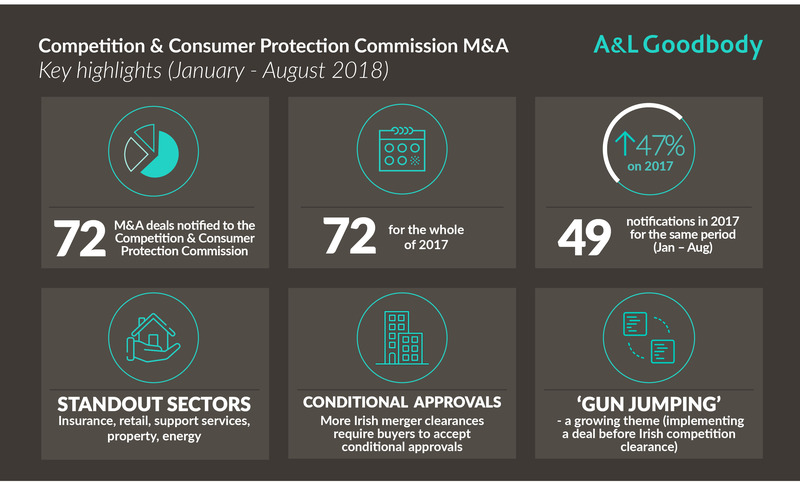 As of now, there are 72 M&A deals notified to the Competition and Consumer Protection Commission in January-August 2018. There were 49 notifications in the same period in 2017. That is an increase of 47% YOY. Indeed, there had been 72 for the whole of 2017. Many of the deals this year involve small businesses with €3m+ turnover because there is more activity in that sector this year. Various sectors represented with few standouts – insurance, retail, support services, property, energy and others all represented. Simple deals are moving through the CCPC quickly but there are more conditional approvals with commitments being given in more "interesting" deals. Gun-jumping (implementing deals before approval) is a growing theme and the CCPC are investigating this more as an possible issue. CCPC looking not just at merger control issues but also competition and consumer protection ones too. What was notified to the CCPC between 1 January and 31 August 2018? M/18/029 - Givaudan S.A./Naturex S.A.
For further information, contact Dr Vincent Power or any member of A&L Goodbody’s EU, Competition & Procurement team.